Gently pull down your lower lid until it forms a small “pocket” (See illustration). DROPS – Slowly squeeze the bottle until one drop forms on the tip. Then, squeeze just a bit more until a single drop is released. After the drop has entered the “pocket,” gently close the eye. Do not blink, squeeze or blot the eye. Keep the eye gently closed for three full minutes. Be careful that your dropper tip does not touch your eye, your fingers, or any other surface. OINTMENT – Slowly squeeze the tube, depositing a strip of medication on the inside of the lower eyelid. Be careful that the tube tip does not touch your eye, your fingers or any other surface. Release your lower lid and close your eye gently for three minutes. Do not blink, squeeze or blot the eye. Use the daytime lubricant four times per day. Apply the first drop upon awakening. Evenly space the other three doses throughout the day. Use the nighttime lubricant immediately before going to bed. If your vision is not blurry after you have applied the ointment, you have not applied it in the correct location, or you have not used enough. If you awaken in the night, apply the ointment again. If you awaken in the morning with clear vision, you have not applied enough ointment the night before. BE CONSISTENT WITH THE USE OF THESE LUBRICANTS. Do NOT discontinue the lubricants on the day of your follow up visit. Make sure that all of your doctors know which medications you are taking for your eyes. Tell your eye doctor about any changes in your vision. To help you remember to take your eye medicine, create a routine such as timing your drops on arising, with meals or at bedtime. Select a place to store your eye medications with your other daily medicines in a location where you are likely to see them regularly. Ask your pharmacist if a medication requires special handling or storage. If you are using more than one kind of eye drop, wait at least five minutes between medication applications. If you miss your scheduled time for an eye drop, take it as soon as you remember. Do not wait until the next planned application. Take your next dose as scheduled unless you are within one hour of your next dose, in which case you should only apply one treatment. The cornea and the conjunctiva absorb eye drops that are applied. Medications applied to the eye are also transported into the body’s circulation by the following route: excess eye drops flow through small holes in the upper and lower eyelids (puncta) into ductwork (canaliculi, nasolacrimal sac, and nasolacrimal duct) that terminates in the nasal mucosa. 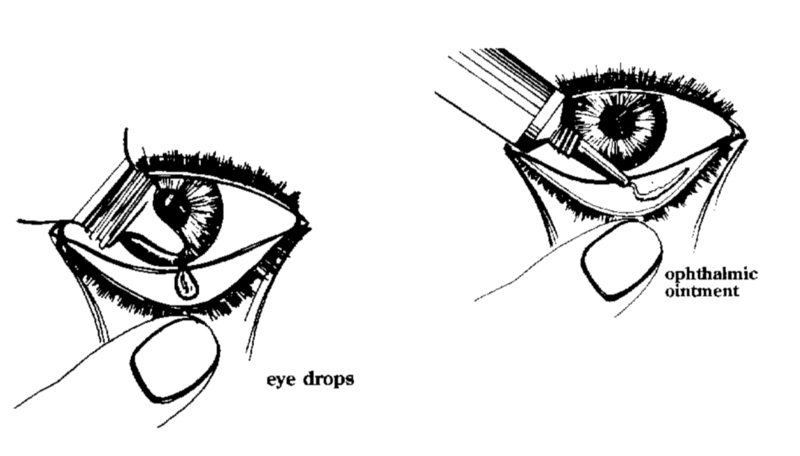 The eye drops then travel back to the throat where the body absorbs the drops. Pressure can be immediately placed over the nasolacrimal sac after the eye drop is applied to the eye and maintained for five minutes to decrease this absorption. The nasolacrimal sac is directly under the skin where the eyelids meet the nose. The recommended dosage regimen for the treatment of corneal ulcers is: Instill one drop onto the affected eye every 15 minutes for the first six hours and then one drop onto the affected eye every 30 minutes for the remainder of the first day. On the second day, instill one drop onto the affected eye hourly. On the third through the fourteenth day, place one drop onto the affected eye every four hours. You should discard all eye medication at the conclusion of the treatment. In other words, do not save opened medications for future use. The potential for contamination is significant for all eye medications. Please be aware of the importance of taking your medications daily. It is crucial for you to continue your medications, even on the day of a pressure check. If a patient mistakenly discontinues their medicines on the day that the pressure is to be measured, it becomes impossible for the physician to assess the effectiveness of the medication. If you are taking Pilocarpine and you are to return to the office for a visual field examination and optical coherence tomography, please discontinue your Pilocarpine 48 hours before that visit. Also, if you are taking Pilocarpine, please do not schedule any other tests with a pressure check or a full examination. If you are taking Pilocarpine, the day that you come to the office for the special glaucoma tests should be for those tests alone. Keep in mind that you should only use lubricants sparingly. Overuse of any eye drop will deplete the eye’s naturally occurring nutrients. Use artificial tears no more than four times per day.